Quality signs that serve your facility. 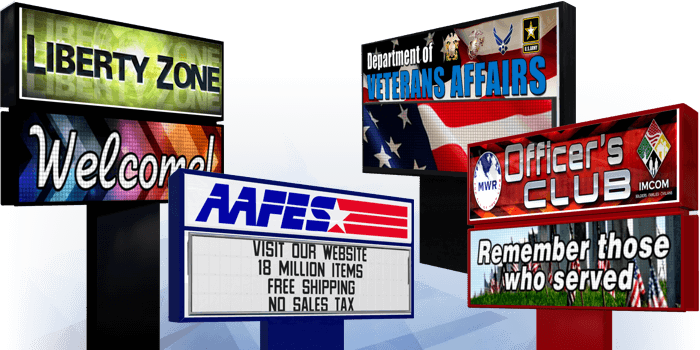 We are a leader in providing high quality signage to military bases, government installations and federal complexes world-wide. We hold a GSA contract (GS-07F-0376J), AFNAFPO contract (F41999-97-D-6186) and are the licensed provider for the American Legion. We proudly serve all of the branches of the United States Military. Our digital displays offer your facility state-of-the-art sign technology combined with the highest level of quality and service. Project a dynamic presence into the community! When graphic appeal and boosting awareness are your focus, these signs are the solution. Identify your facility, enhance your grounds and become a source of civic pride. Bring large-scale video capabilities to your events with a state-of-the-art LED video wall. Turn any wall into a dynamic centerpiece and take your facility to the next level! Functional and attractive signs for your facilities.